Sponsors & Support: Larsen Marine of Yankton, SD, All Star Graphics of Norfolk, NE - Chad / (402)640-6312, www.allstargraphicsnorfolk.com, The Kitchen Place of Yankton, SD and Norfolk, NE - thekitchenplacene.com, Hair and Beyond of Yankton, SD, Larsen Carpet of Yankton, SD. My first ever race in a Crusier I finished 5th. Then the next night at the Cedar County Fair I finished 6th. So I guess that ain't too bad! 2004 - Raced twice in the Cruiser class, both Top 6 finishes. 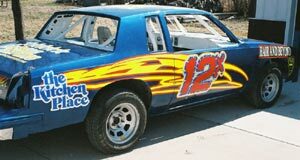 2005 - Raced Hobby Stocks for two races, both Top 10's. 2006 - Ran an awfully full season, finished 15th in Points. Finish in the Top 10 in Points. Some day win the IMCA Super Nationals. Race WDRL or World of Outlaw Late Models full time.